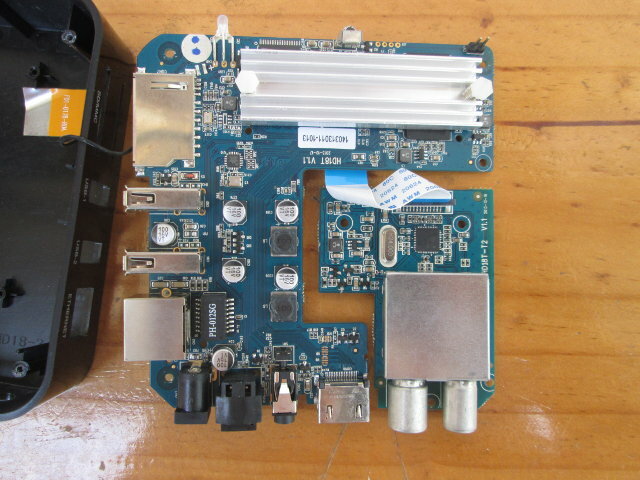 Shenzhen Tomato has sent me a sample of HD18T, an Android TV box powered by Amlogic AML8726-MX dual core processor that features a DVB-T2 tuner with In and Out antenna connectors. This is quite timely as Digital TV in Thailand has just started on April 1st of this year. 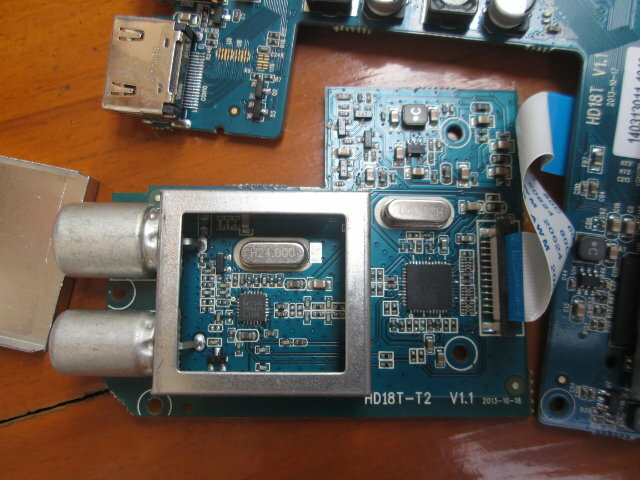 Today, I’ll go through the specs, unbox the device, and show some pictures of the box, the board and DVB-T2 tuner. Audio Output – HDMI, AV, and optical S/PDIF. Dolby TrueHD and DTS HD pass-through. The box runs Android 4.2.2, and XBMC 12.2 Frodo is pre-installed. I’ve received the device in the following package via Fedex with icon with DVB support, Skype, Youtube, Netflix, Facebook, Twitter, and Android Jelly Bean, which are all pre-installed. Inside the package, we;ll find an IR remote control (2x AAA batteries not included), the user’s manual in English, the device itself, an AV cable, a plug adapter, and a European-style 12V/1.5A power adapter. Since Shenzhen Tomato caters to wholesale customers, options may vary for retail packages, and you may end up with an HDMI cable too for example. Let’s have a closer look at the media player’s connectors. There’s a SD/MMC card slot, two USB host port, and an Ethernet port on one side, and a 12V power jack, optional S/PDIF output, AV output (composite + stereo audio), HDMI, and IN and OUT antenna connectors for digital TV. There’s also a LED and an IR receiver on the front panel which can’t be seen on the pictures. You can also watch the unboxing video below. Time to check out what’s inside the box. 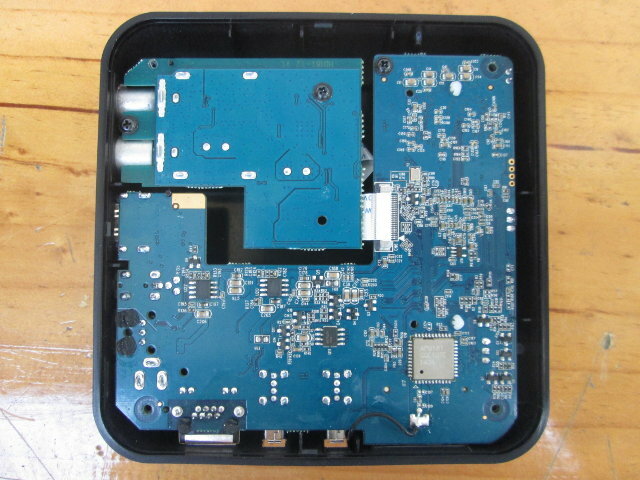 After removing 4 sticky rubber pads at the bottom, and untied four screws, we can see there are two boards: the mainb oard and the DVB-T2 tuner connected via a flat cable. There’s not much else to see here, except the Wi-Fi & Bluetooth module is Broadcom AP6181. After removing three more screws, we finally get to see to boards up close. There’s a heatsink on the RAM, flash, and Amlogic SoC, and you’ll also noticed a recovery button at the back of the AV jack. The main board is marked HD18T v1.1, and the DVB-T2 tuner board marked HD18T-T2 V1.1, both designed in October 2013. I assume they just change the latter for DVB-S2 tuner, or ASTC tuners and keep the main board identical between different products. I’ve removed the shield from the tuner, and taken a picture of the board. There are two ICs. The smaller inside the shield is NM120AA (origin unknown, but found in other models) but I could not quite clearly read the markings on the larger one, but it might be Silicon Labs Si2168 DVB-T2/T/C digital demodulator. If you are a reseller, you could consider purchasing the box in quantity via Shenzhen Tomato, who provided this sample for review. Individuals can buy the device from Geekbuying for $93 (called EM6-T2), on Aliexpress for $70 and up (mostly known as Vigica C6), or DealExtreme ($85.28) among others. I highly doubt it has TrueHD or DTS-HD pass-through on an Amlogic 8726-MX part, probably just regular Dolby/DTS. I would love to get my hands on this device, I ordered one from Mobase Aliexpress and received instead the Minix X7 (after freaking three months). The tuner is NMI120 from Newport Media and there’s a Linux driver in Amlogic 3.0.50 sources for it. The demodulator Si2168 also got Linux driver in Amlogic sources but there’s also a new driver in Linux media tree (probably will be added in 3.16) written by Antti Palosaari. Yes XBMC needs a DVB backend and tvheadend is not available for Android. and a quick web search reveals that MuMUDVB should work as replacement for tvheadend as a DVB backend for XBMC. So it should be possible to use XBMC with MuMuDVB to get live TV via the DVB-t2 tuner. It will be interesting to hear CNX report back on how sensititive is the tuner when they connect up a TV antenna or two of the correct type — VHF or UHF or both — depending on the frequency of the local TV transmitters. For UHF transmissions which have adequate signal strength in the locality, the best choice is a log periodic antenna. Shenzhen Tomato continuously delayed shipping for the box to make it better, so some of the issues may have been fixed. @Harley also talked to me about mentioning XBMC + TVbackend in a blog post, and that could make a project, but I don’t feel comfortable, 1. Because I don’t want to be too much involved, 2. Because I may not really what I’m talking about without spending some serious time studying all it all integrates. Now if somebody who fairly knows how everything works, and is ready to mentor people who may want to take on this project (preferably XBMC or Tvbackhead developers), I would be perfectly fine with publishing a guest post. In Chiang Mai, transmission antenna could be found in 18 48 34.8 N 98 55 03 E or Doi Suthep. Thanks. Nice DIY antenna… I think I’ll try at my sister-in-law house, I’ve noticed they have a roof antenna. I’m not sure it’s still connected though. Would you know where I can find the frequencies for the different channels. I’m not sure autoscan with work with that box since I can only select pre-set autoscan frqequencies for 5 countries. 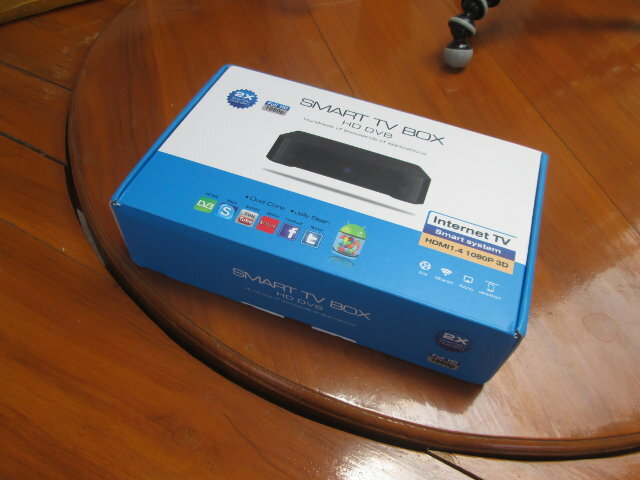 I had purchase this box and use it at Singapore, android system work ok. But this device cannot receive any DVB-T2 signal from singapore free to air tv station. either i search auto or manually. So beware if you want to use it as ur DVB t2 receiver. Thanks for that report. I’ve been unable to get any signals either, but I thought it was because I used an indoor VHF/UHF antenna, and it was not enough. So maybe there are other problems. I’m waiting to get a working reference box to try it again. Can this DVB-T2 be used as a DVB-C? Can someone test it, pls? This box do not work with Singapore DVB-T2 for sure, however DVB-T works well. A simple indoor antenna should be enough to receive the signal. If you dun try adjust the position of ur antenna. My advice, do not buy this box if you want use this box as DVB-t2 receiver, the android system is very basic, it do not support the latest XBMC 13.1. 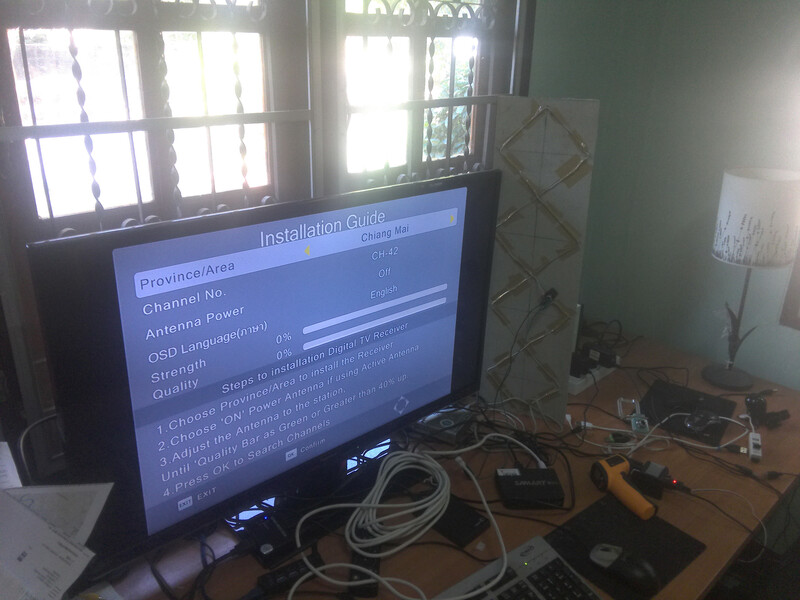 It good to purchase a standalone quad-core android box and a dvb-t2 receiver. Hi cxnsoft how was the HD18T at playing 1080p MKV files in XBMC? Was it smooth playback or was there a bit of stutter? I’ve finally made an antenna by the result is not good. 0% signal strength. Maybe I should use another type of cable? I just used one of the two wires in the cable used to wire my house electrical installation. Unless, my box has some issues. I bought this device from DX.com a year ago and it is working fine, i am using it mainly for DVB-T reception and watching movies. I bought a ISDB-T version one from Ali Express 4 years ago and after some time it starts to freeze in the Android logo. I tried to make a firmware update but I think that something went wrong and now only the blue led is on but I have no signal in the TV. Is there a way to unbrick this device? Try to do an update with USB burning too. You’ll need a IMG firmware, not ZIP.